Building a multi-species water management tool to compliment water planning in the Sacramento River and Sacramento-San Joaquin Delta and innovating anew paradigm of“turn taking”to create flexible opportunities for multiple species tobe successful through time. 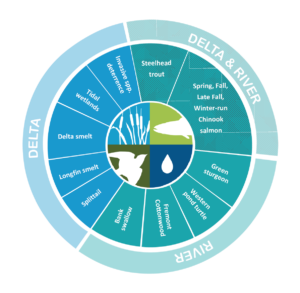 Building a multi-species water management tool to complement water planning in the Sacramento River and Sacramento-San Joaquin Delta and innovating a new paradigm of “turn taking” to create flexible opportunities for multiple species to be successful through time. The Ecological Flows Tool (EFT) is a comprehensive integrative decision support tool for evaluating how Sacramento River and Sacramento-San Joaquin Delta (SRBD) flow regimes can be specialized to promote favourable habitat conditions for multiple species. Because EFT synthesizes such a wide range of ecological and physical habitat information it provides a more comprehensive picture of the environmental needs of the SRBD relative to other approaches that focus on a narrower range of individual species. Ecological Flows Tool was championed by The Nature Conservancy and has benefitted from the contributions of over 70 scientists and water managers since 2004. It has been used by State and Federal agencies to evaluate the ecological effects of various proposed scenarios that would alter flow in the SRBD. Its results have been used in environmental effects analyses and impact studies, providing valuable data for decision makers who are inundated by duelling models and scientific uncertainties. 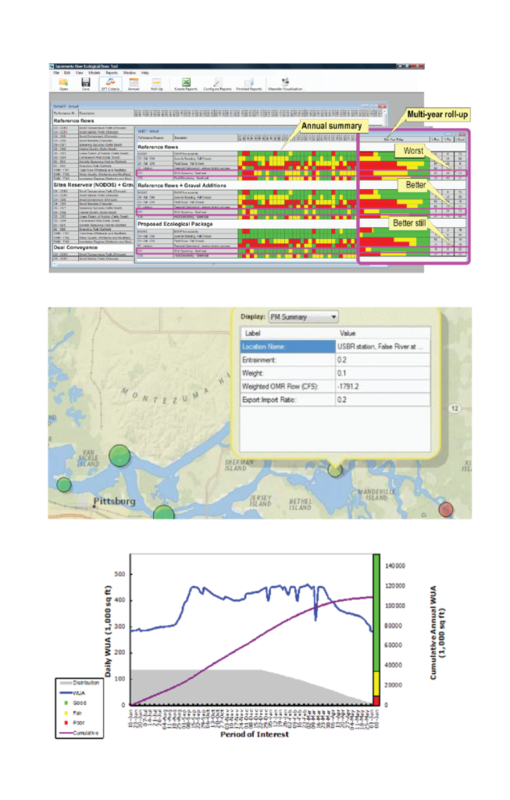 Most notably, Ecological Flows Tool has made a significant contribution to the theory behind managing and balancing flows for competing uses (be they people, farms, cottonwood trees or delta smelt) by highlighting the largely unexplored power of “turn taking” in water management. Rather than trying to optimize conditions for all target species every year and having to pick the water winners and water losers, “turn taking” capitalizes on the natural ability of many aquatic and riparian species to withstand natural periods of unfavourable conditions. EFT’s “turn taking” approach provides a truly holistic management system that assists in identifying the types of water operations that result in more species being successful through time rather than attempting to globally optimize all objectives simultaneously. Waters of the Sacramento River and Delta: Highly regulated and in high demand. 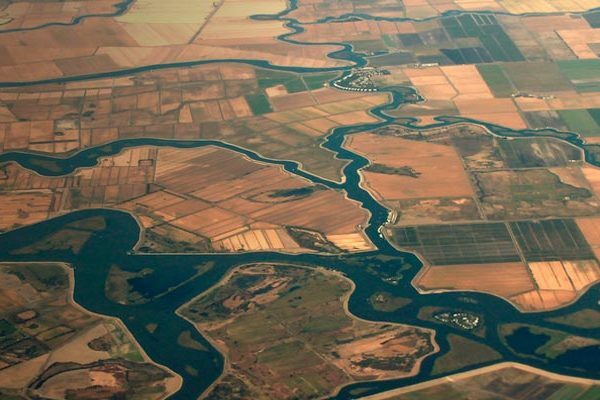 The waters of the Sacramento River and Sacramento-San Joaquin Delta are some of the most highly regulated in the world, serving over 20 million people and supporting a large fraction of the State’s $40 billion agriculture industry. Water management agencies in California spend more than $30 billion annually to deliver water supplies, prevent water pollution, provide flood protection, and manage aquatic ecosystems. 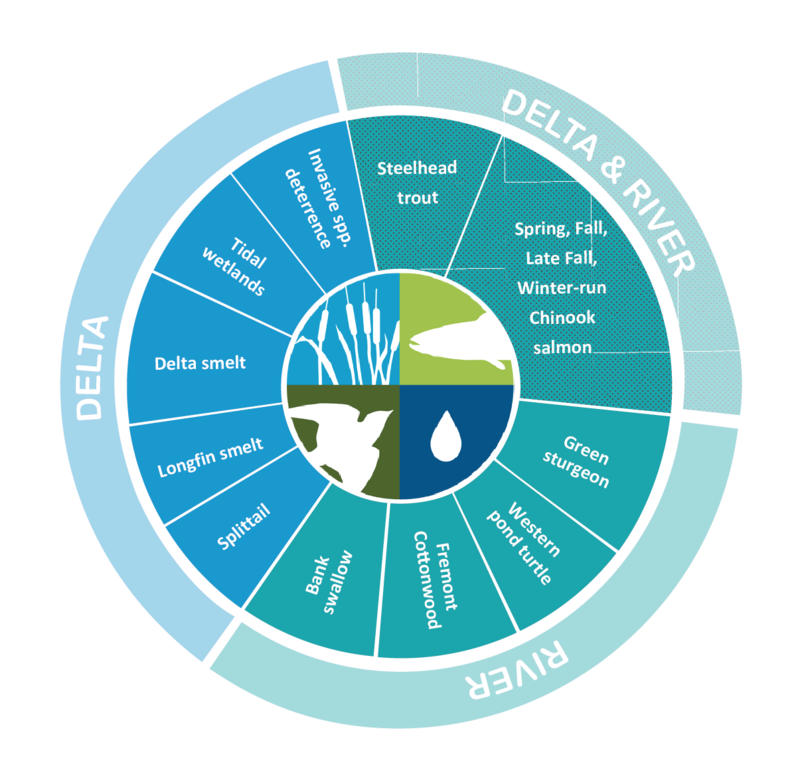 These eco-regions also sustain diverse and highly altered ecosystems, many of which support endangered species and species of concern, such as multiple run-types of Chinook salmon, Delta smelt, longfin smelt, splittail and Fremont cottonwood. A summary of the key species and habitats incorporated into the Ecological Flows Tool. The addition of dams and revetment along the Sacramento River has contributed to the loss of habitat and related natural flow functions for many river-dependent plants and animals. Changing how and when water is released from northern California dams and exported in the Delta can help these species recover. However, exactly how to release the water so it makes the most difference to the ecosystems and a wider range of species is fraught with uncertainty. “This project started off in 2004 with a vision around how to manage flows for multiple important species simultaneously instead of the prevailing focus where a lot of energy and spotlight is placed on single species responses, an approach that inadvertently promotes a divide between water winners and losers,” explains Clint Alexander, President of ESSA. Water allocation decisions tend to create a world of water winners and water losers. The Ecological Flows Tool project began in 2004 with the goal to provide a better understanding of how water management operations across the Sacramento River and Sacramento-San Joaquin Delta (SRBD) could better meet the needs of multiple aquatic and riparian species and do so in a way that was still compatible with existing water delivery for human use. Many river-dependent plants and animals are strongly influenced by and have adapted to a river’s natural variation in flow and many fish and riparian species possess traits that allow them to tolerate or exploit certain flow conditions. Ecological flow management is widely recognized as an important tool that can promote the resilience and recovery of native species. But meeting water needs of specific aquatic and riparian species often comes at the expense of other species in the ecosystem not to mention hard trade-offs with other beneficiaries of water – people (energy and flood protection, agricultural and municipal water supplies, etc.). Conflicting objectives and trade-offs between beneficiaries of water (be they human or fish) is endemic to water-use planning and is the centerpiece of the challenge tackled by EFT. Expand the number of species and interconnected hydro-ecological processes in the model and take turns favouring different water needs. “For the Ecological Flows Tool we conducted a series of design and peer review workshops with over 70 agency and academic experts and managers and through a very conscious process selected 13 focal species and 25 functionally distinct performance indicators that we then coupled with physical models that predict flows, water temperature, salinity, channel migration and sediment transport,” explains Alexander. The end result was a decision support system that not only showed water managers how changes in the flow management would change the habitat for 13 species in the SRBD, but a tool that also highlighted the sharp ecological trade-offs associated with different water operations. “The majority of experts that advised on EFT’s design encouraged us to aim for a ‘Goldilocks’ level of detail on individual species and to include a broader range of species and ecosystem processes in the tool,” says Alexander. Example interfaces and outputs of the Ecological Flows Tool, which provide traffic light ratings for different flow regimes to indicate their performance on a range of ecological indicators. As the name suggests, TTO takes turns meeting the various species’ water needs to achieve greater ecosystem benefits. “We put all these models up in the cloud and taught them how to run in an unattended and automated way with an optimization approach. So the physical and ecological models run thousands of times, sharing information back and forth, and find something that has the maximum amount of multiple species balancing through time,” he explains. Many aquatic and riparian species evolved to withstand droughts and floods and natural disturbance. TTO takes advantage of the adaptive range within a species to withstand difficult conditions. For each species, the period of “poor” conditions that they can weather is different. For example, salmon won’t be able to withstand as many years of poor conditions as a population of cotton trees. This means that in the “turn taking” optimization, you invest in favourable flow conditions for salmon more often that you would for cottonwoods in order to achieve more ecosystem objectives over the long term. The approach also dynamically shifts priorities to recognize the emergence of relatively rare hydrologic conditions that only come around occasionally (e.g., high flow events that support slow river stage recession for cottonwoods). 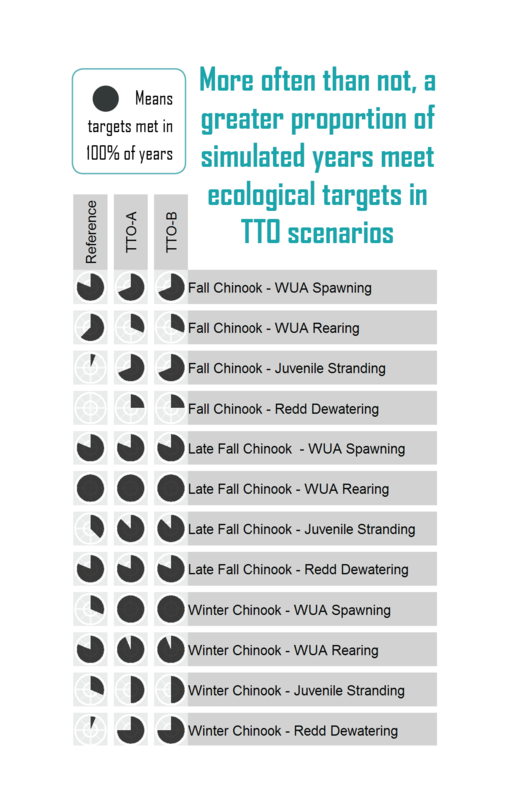 A figure showing how turn-taking water management scenarios (TTO) perform better than the reference or “Business-as-Usual” management scenarios, with more species meeting their ecological indicator targets in a greater proportion of simulated years under TTO conditions.